If you’re a small business owner, there’s always too many things to do. Things you should be doing, or things you could be doing. There’s probably always a decade’s worth of stuff you could be doing. The question is, what are the best things you should be doing? The most effective things. What deserves top placement on that unbelievably competitive publication known as your to-do list? As you know from the headline above, I’m about to make the case that email marketing should be on top of your to-do list, or at least near the top. Since starting email marketing for my startup Due, we’ve been able to see a lift in Fortunately, if you’re reading this at all, you’re probably already at least open to the idea of doing some email marketing for your business. Or maybe you’ve already got your toe in the water with email marketing and you’d like to get a little deeper into the pool. You’re definitely not alone. Wasp Barcode who surveyed over 1,000 startups found out recently that almost half of the small businesses surveyed are doing email marketing. Whether you’re already underway with email marketing or still on the sidelines, I’ve got seven very compelling reasons your business should be using this particular marketing tactic. Reasons compelling enough to make it rise to the top of even your busy to-do list. In that same survey I mentioned above, we learned something pretty amazing about you small startup folks. It’s that you’re cheapskates, at least when it comes to marketing. I mean that in a nice way. Even a respectful way, actually. If you weren’t pretty sly about holding on to every dollar possible, you probably wouldn’t be in business. 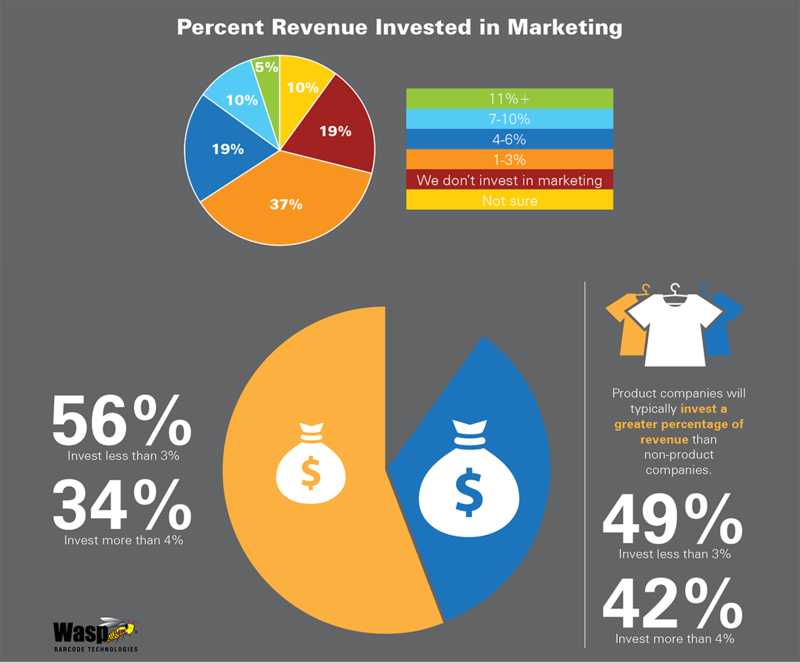 According to our survey, most of you spend less than 4% of your revenue on marketing. Wow. With a shoestring budget like that, is it possible to do any kind of marketing? Yes, actually. You can do email marketing. You can have a free MailChimp account for up to 2,000 contacts, and send unlimited emails to them. There’s also AWeber, which is $19 a month, or Constant Contact for $20 a month. There are dozens of other email service providers – pick any one you like. But you can do email marketing for $20 or less a month. Even you, my amazingly thrifty friends, can afford email marketing. You could get all fancy with email and make it into something complicated. But you don’t have to. Those nice email service providers have made creating and sending an email almost brain dead easy. They’ve also created easy-to-use widgets that make getting email subscribers easy, too. Pretty much any problem a small business owner has run into in the last decade, they’ve got a solution for. That’s part of why when Ascend2 surveyed 333 digital marketers about different marketing tactics, email trounced everything else, both in terms of how easy it was to do, and how effective it was. You can put together an email message in 90 minutes or less. 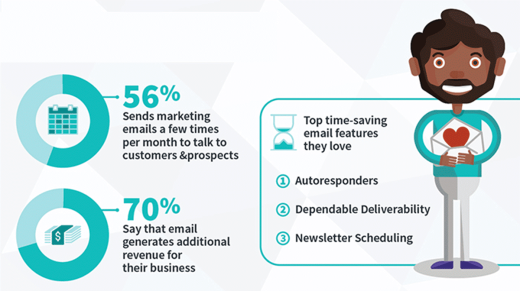 Once you’re used to creating and sending emails you’ll probably be able to do it in 45 minutes or less. That’s because ESPs (email service providers) offer hundreds of email templates to choose from, and because you can use a drag and drop interface to lay out your emails. That leaves you to write a few paragraphs, drop in a few pictures, send a test email or two, and then schedule when to send your message. There are even ways to automate your email marketing so every time you publish a blog post it automatically gets formatted and scheduled to be sent to your subscribers… without one keystroke of work by you. Sweet! 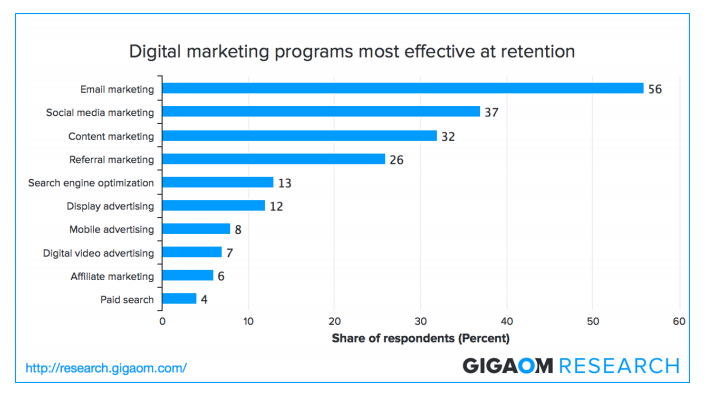 One other thing we learned from our survey was that you’re very focused on improving your customers’ experience and retaining them. That’s smart. 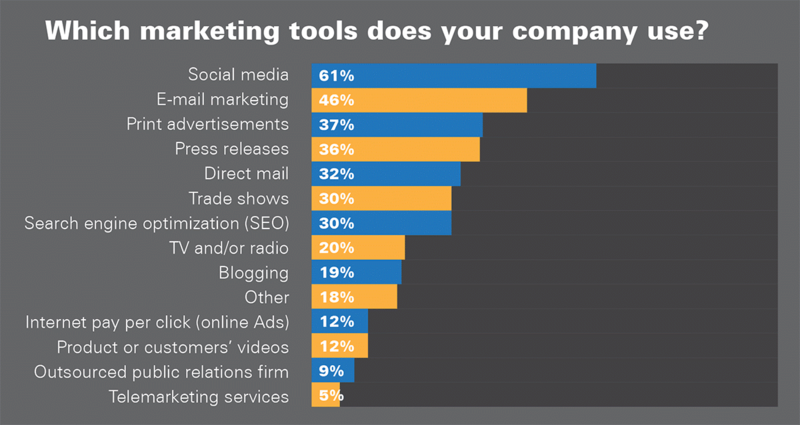 Credit: Marketing Sherpa’s article, “Marketing Research Chart: How do customers want to communicate? 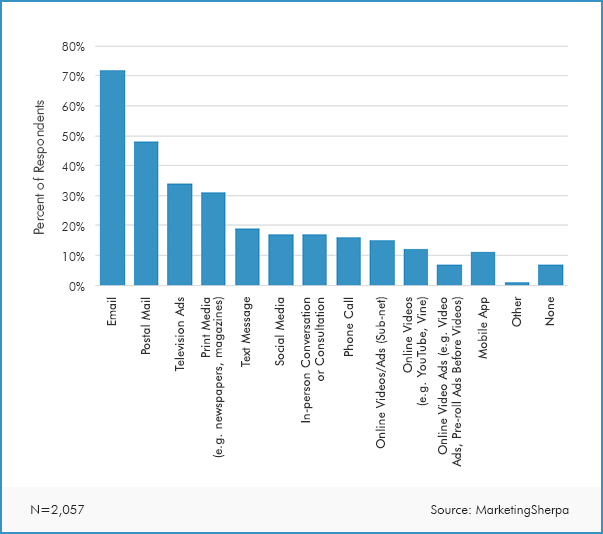 Think email marketing is limited to sending newsletters? Think again. There are a bunch of other ways businesses can use emails. 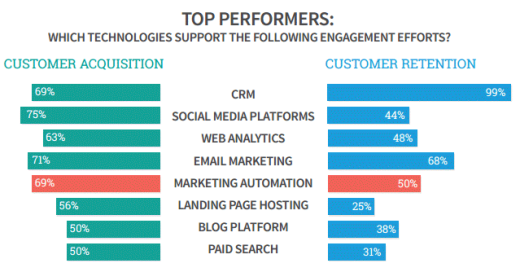 The chart below is from the “2015 State of Marketing” report published by Salesforce. 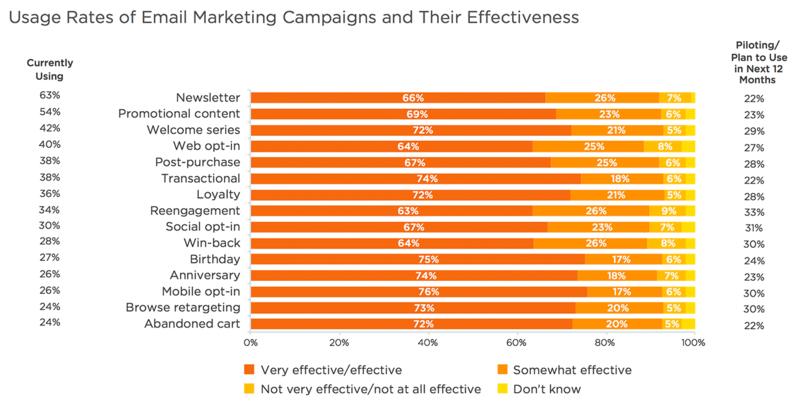 It shows all the different types of email messages that can be sent, then shows how effective each is according to the survey respondents. 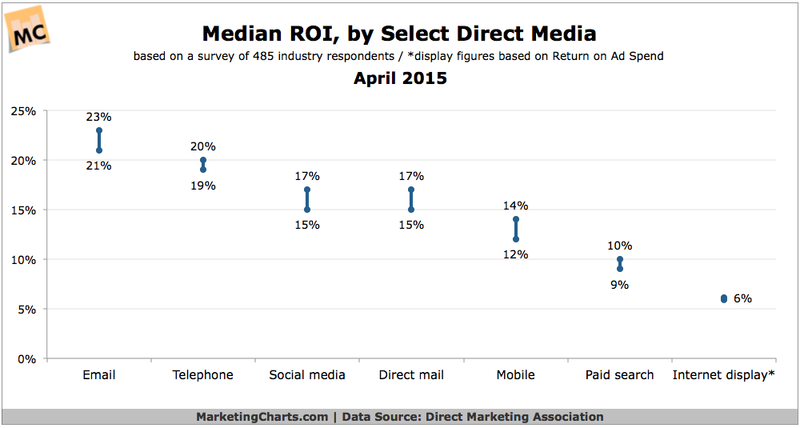 By now you’re probably getting the gist of this: Email rocks. 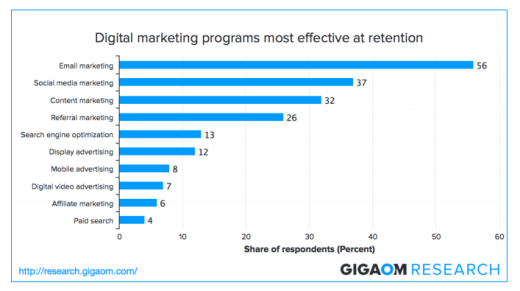 Want some closing words on just why email might even beat out social media as a priority? Consider that LinkedIn expert Melodie Dodaro recently wrote a blog post titled, “Social Media Is a Waste of Time Without Building an Email List”. 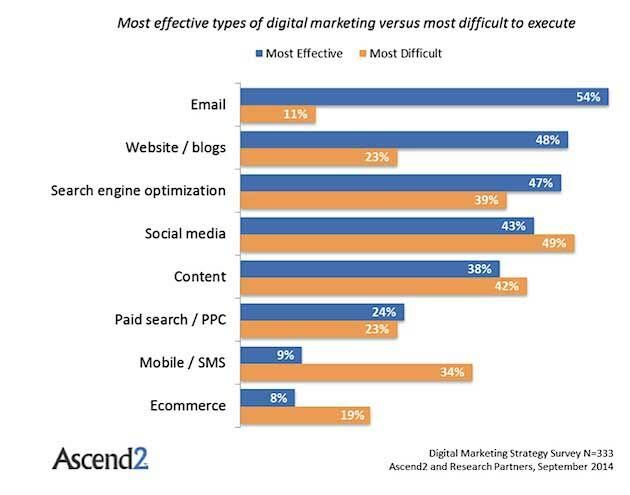 What are your thoughts about email marketing? Are you doing any email marketing or thinking about trying it? How well has it worked for you? Tell us about it in the comments.